The Internet has allowed music explorer’s to unearth new music and appreciate all that music has to offer. In this current issue we have reviewed a number of sites that provide our readers with ways to discover and learn more about composers and what makes music so universal. From the Mississippi delta blues, to swinging jazz, to classic rock, America has produced some of the best music and musicians in the world. What about music from 1800’s America? Orchestral, band, piano, and choral music became very popular in America during the 1800’s. 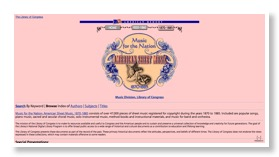 Music for the Nation is a Website that allows music lovers to discover and search many popular works of sheet music of the 1800’s. For research or for someone just wanting to explore about music, this site offers the music enthusiast a place to enjoy and learn more about music history. Classical music is appreciated almost everywhere around the world. With the power of the Internet, classical music aficionados can discover and find works of the Soviet Union’s best composers and musicians. 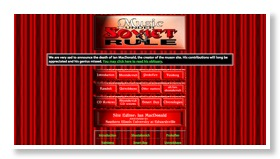 “Music under Soviet Rule” allows a reader to read up and learn more about the most talented Soviet composers and musicians, get fun facts and timelines for each composer, and enjoy some CD reviews. For something different the music of the 18th century had not only civil war music, popular hymn music of that time, and notable folk songs. Music lovers can browse through the “Public Domain Music” Website to learn about America’s best 19th century composers, and hear music examples free of charge. They can also browse through the music library and discover new types of music such as blues, ragtime piano, hymns, folk, and harp music. 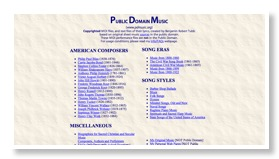 For anyone who loves discovering new music or just listening to some good old classic music, “Public Domain Music” is useful to explore. From the early masterworks of Guillaume de Machaut to the modern works of Claude Debussy, “Musical Epochs” is a site to view these and many other classical music pieces. The site allows one to search and discover the works of the best composers from the Middle Ages era all the way to the modern era. It also allows one to learn about the history of the many composers, see a list of their most famous works, and listen and preview their noteworthy pieces of music. 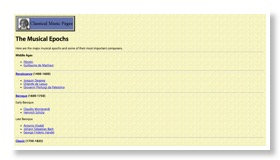 The site also allows one to dive into the past and experience and appreciate the music of that time.